A colorful duck of the northern seacoasts, the Common Eider is the largest duck in the Northern Hemisphere. The male's bright white, black, and green plumage contrasts markedly with the female's camouflaging dull striped brown. The Pacific form of the Common Eider is distinct genetically and morphologically from the other forms, and may be a different species. The male has a thin black V on its chin and a bright yellow or orange bill. Mother Common Eiders lead their young to water, and often are accompanied by nonbreeding hens that participate in chick protection. Broods often come together to form "crèches" of a few to over 150 ducklings. Attacks by predators may cause several broods to cluster together into a crèche. Once formed, a crèche tends to stay together throughout the brood rearing period, although some of the different females attending it may leave. 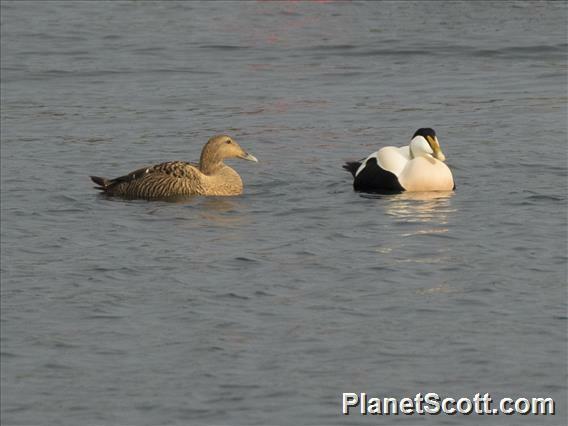 Bibliographic Citation: "Common Eider (Somateria mollissima)." The Cornell Lab or Ornithology All About Birds. Citation Link Accessed 28 Jan 2014.